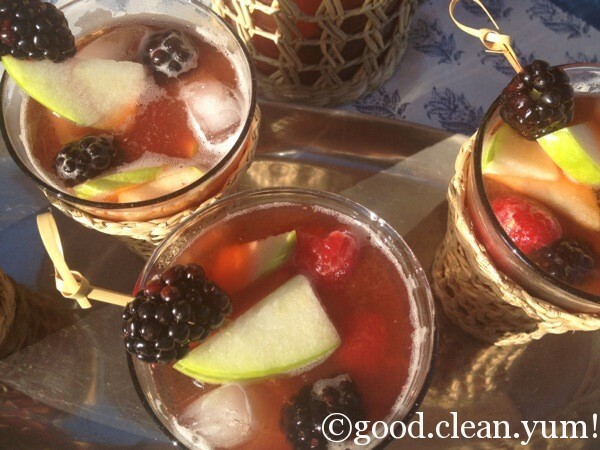 “30 Days” Sangria | good.clean.yum! As August comes to an end, I find that I desperately want to squeeze the last drops out of summer and drink it down: the red heat of the sun, the fresh tang from walking the beach, the heavy perfume of farm-ripened berries, the high energy from the crush of tourists discovering my town and the unhurried sweetness of relaxed moments spent with good friends. 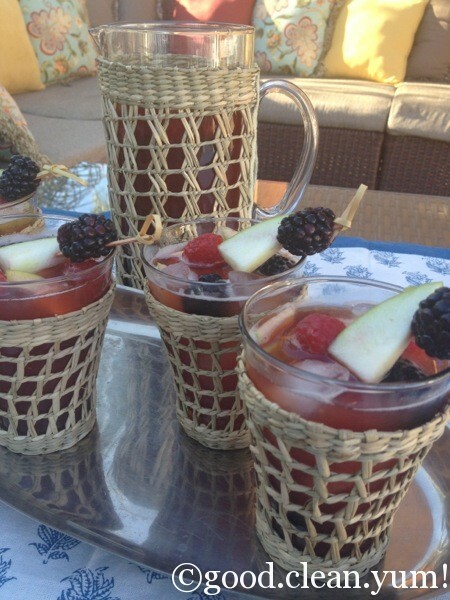 One of my favorite summer drinks to make is a big, chilled pitcher of sangria. On the hottest days, sangria over ice is magical to me. I first tasted it in Rio de Janeiro while vacationing with friends. Never having heard of it before, I was entranced by my first sip. I loved that cold, fruity wine cocktail that went down so easily! Trying to walk back to our hotel was pretty challenging with all those lampposts trying to block my path! Girded with my newfound respect for the potency of this drink, I have since tried many sangria recipes over the years. The numerous variations on wine, fruit, club soda and ice are impressive. Everyone seems to have their own preference: some like it loaded with every fruit possible and some only citrus, some like more club soda than wine and others the reverse, some like it very sweet and some like it strong, some like it with red wine and others adore it with white wine. Some people even add in their “secret ingredient” that takes it over the edge. I, too, have my tried and true favorite sangria recipe. And I, too, have my “secret ingredient” that makes it my specialty. However, no matter which recipe you use, I do honestly believe that sangria tastes better when you are sharing it with friends. I was introduced to rooibos tea about 15 years ago, sitting in a friend’s kitchen in Berlin, Germany. I was immediately taken by the rich, satisfying taste and it is a definite favorite of mine. Rooibos means “red bush” in Afrikaans and the bush is grown only in a small area in South Africa. Rooibos contains high levels of antioxidants, is caffeine-free, has low levels of tannins and contains iron, potassium and copper. I chose to use organic vanilla rooibos tea as the base for this non-alcoholic sangria because to me, rooibos tea has a deep, warm, rich flavor profile similar to red wine. Steep the rooibos tea bags in the hot water until the tea has cooled completely. Remove tea bags, one at a time, squeezing carefully to extract as much tea as possible. Chill the concentrated tea in the refrigerator for at least 2 hours, or overnight. Meanwhile, purée the 9 ounces of raspberries by placing them in a sieve over a bowl and pushing down on the raspberries with the back of a spoon. Continue pushing and scraping the raspberries around in the sieve until you are just left with pulp and seeds and the bowl below holds the purée. Be patient, this step may take about 10 minutes or so. Add in the agave nectar. Into a pretty pitcher, add the rooibos tea concentrate, the raspberry purée, the remaining diced green apple, the remaining raspberries and the remaining blackberries, remembering to hold some back for the garnish. Stir and allow the flavors to mingle a while, about half an hour in the refrigerator. 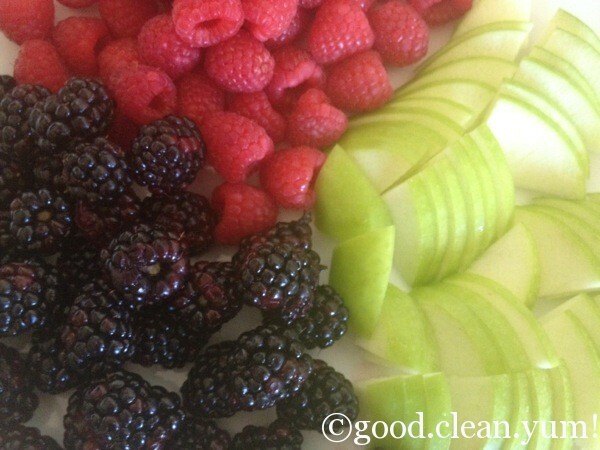 Make your drink garnishes by threading a piece of the green apple, a raspberry and a blackberry onto cocktail toothpicks. When ready to serve: into each glass place a handful of ice cubes and a ladle of the fruit that has been steeping in the tea. Pour in some tea to almost the top of the glass. 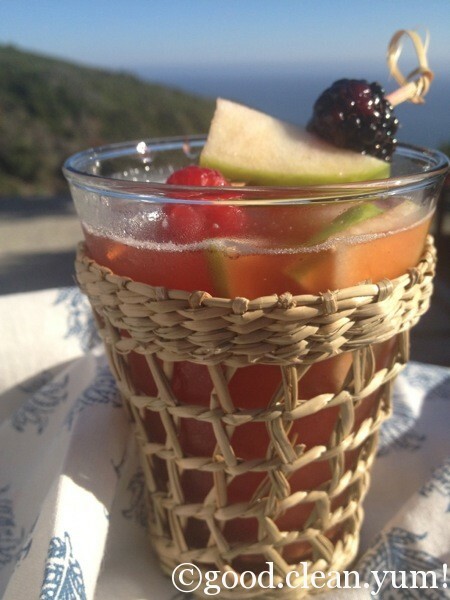 A splash of club soda and the garnish atop the glass – you will not miss the wine, promise! This recipe makes 12, ½ cup servings over ice with fruit. 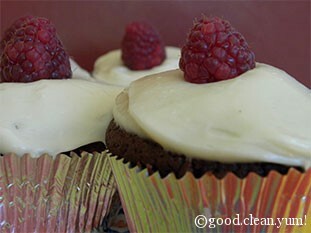 Gluten-free, alcohol-free, and sugar-free!